Welcome to your mini 10-minute circuit workout! A circuit means to string exercises together with little to no rest in between, and that’s what this heart-pumping workout is all about. If you’ve ever wondered if you can get a solid workout in just 10 minutes, this total body routine is your answer. Chris will start this 10-minute circuit workout with a quick warm-up to get your muscles activated and your joints mobilized. Moves like hip circles will warm up your ball and socket joints to make sure you get the most out of the moves ahead, while squats and hamstring curls will wake up your legs and knees. Each circuit in the 10-minute circuit workout will consist of 45 seconds of work followed by 15 seconds of rest. Chris will guide you through each exercise, encouraging you to use heavy weights when possible but providing modifications whenever needed. Your 10-minute circuit workout starts with alternating lunges with overhead presses. Chris will show you the proper form to get the most out of this powerhouse move, which will not only work your legs and lower body but help improve your balance. Next, it’s onto moves like squat jacks—a great plyometric exercise that helps build bone mass—and push-ups with alternating punches. Experience core and arm-strengthening moves like army crawls, as well as cardio drills like “Run the Tires” to keep your heart pumping and have you feeling the burn! Chris will do the moves in this 10-minute circuit workout right along with you, providing plenty of inspiration along the way. If you’re looking for a 10-minute workout to tone and strengthen your total body, this is the routine for you! If you enjoy this workout, be sure to check out our slow burn workout or some of our other high intensity workouts on Get Healthy U TV! 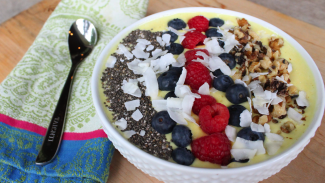 One of our favorite things to make for breakfast is a smoothie bowl; they’re so easy to make and super healthy. All you’ll need are a few simple ingredients and a blender to mix-up a fresh and tropical smoothie bowl that will start your morning off right! Watch as Chris provides step-by-step instructions to create a meal that will start your morning off right. Finish off your bowl with toppings of your choice like coconut flakes, chia seeds, and berries to make a colorful and nutritious breakfast that will fuel you all morning long.